I birthed my first child in a hospital, nurses and doctors and residents gathered around. I birthed my third child at home, leaning on my husband as the midwife caught our baby girl. But my second child, he didn't wait for a doctor or a midwife. That one was born screaming into his Oma's hands, his Daddy on the phone telling the paramedics that yes, yes, the baby is being born RIGHT NOW!! My unexpected baby-catcher was trembling, and I was leaning on a bathtub instead of my husband. The paramedics arrived and then the midwife soon followed and everything ends well, praise to God, with this story. It was, afterwards, merely a small blip in a pregnancy otherwise filled with excellent care and support. Halfway across the world, another mother is not so fortunate. For this woman and far too many others, the lack of a midwife or doctor is neither a too-fast accident nor a deliberate choice. Instead, it is the reality of life in rural Africa. With a severe shortage of doctors across Africa and access to care very limited in rural areas, 1 in 22 women die during childbirth. Enter Shanti Uganda. The Shanti Uganda Society is a registered Canadian charity and Ugandan non-profit organization whose mission is to improve infant and maternal health, provide safe women-centered care, and support the well-being of birthing mothers and women living with HIV/AIDS in Uganda. One of Shanti Uganda's primary programs is the Shanti Uganda Birth House & Clinic. Located in the rural Luweero District of Uganda, the solar-powered Birth House provides mother-centered pregnancy, birth and postnatal care. 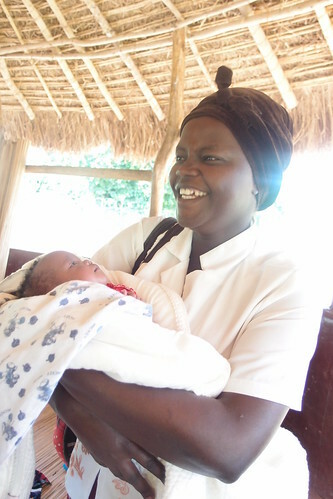 Its team of six trained Ugandan midwives are dedicated to improving birth outcomes and reducing maternal and infant mortality rates in Uganda. From the Birth House, Shanti Uganda also runs prenatal education classes, a Community Garden Program, a Teen Girls Program, and a Women’s Income Generating Group. "Over 100 women die giving birth in Uganda every week. Not only is Shanti Uganda providing a safe, empowering environment for women to give birth, but we are defying these statistics and creating a new norm for birthing women in Uganda. Of the over 100 women who have given birth at our centre in our almost two years of operation, 100% have left healthy, happy and supported by our dedicated team of midwives." In order for the Birth House to continue, it needs a stable funding base. 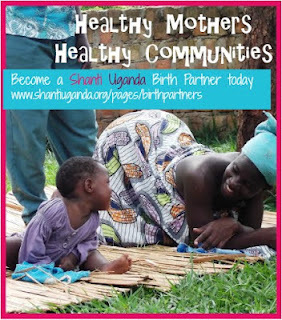 Shanti Uganda's Birth Partners program makes it easy for supporters to contribute a monthly donation. While one-time donations are always gratefully received, a regular monthly donation helps Shanti Uganda to provide consistent levels of support and care with the least amount of administration costs, stretching your dollars even further. As a Birth Partner, your donation is used to provide consistent care to expectant mothers and their babies in rural Uganda throughout pregnancy and birth. A monthly donation of $25 supports the birth of one baby every two months. sterile equipment and birth supplies. Birth partners will receive a special welcome gift, quarterly email updates, and an annual tax receipt. What's more, you'll have the satisfaction of knowing that you're standing up for maternal equity, healthy mothers, and healthy babies. Consider becoming a Birth Partner today. Together we can work toward a world where every birthing mother has the care and support she needs and deserves.